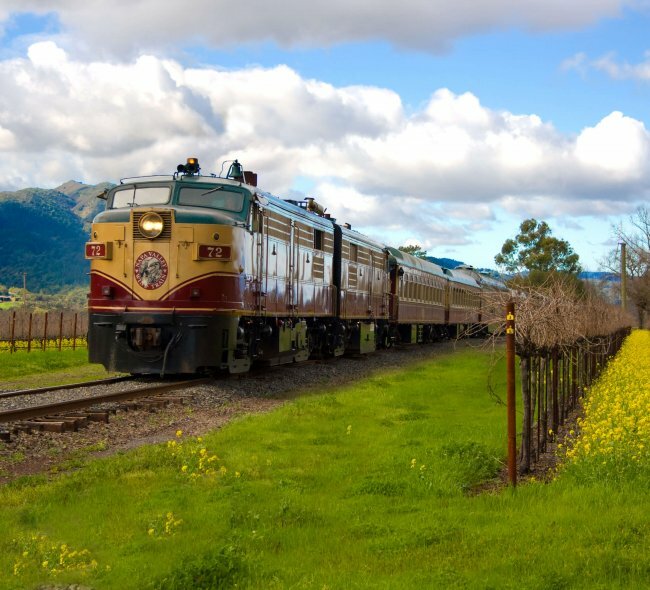 Railcars once used as first-class coaches for Northern Pacific Railway’s premiere trains—the North Coast Limited and the Northern Pacific Atlantic Express—and its Ski Train service from Denver to Winter Park now carry Wine Train passengers through the lush Napa Valley landscape. Built entirely out of steel in 1915 by the Pullman Standard Company, they were the height of technological advancement of their time, with electric lights, steam heat, and arched windows. 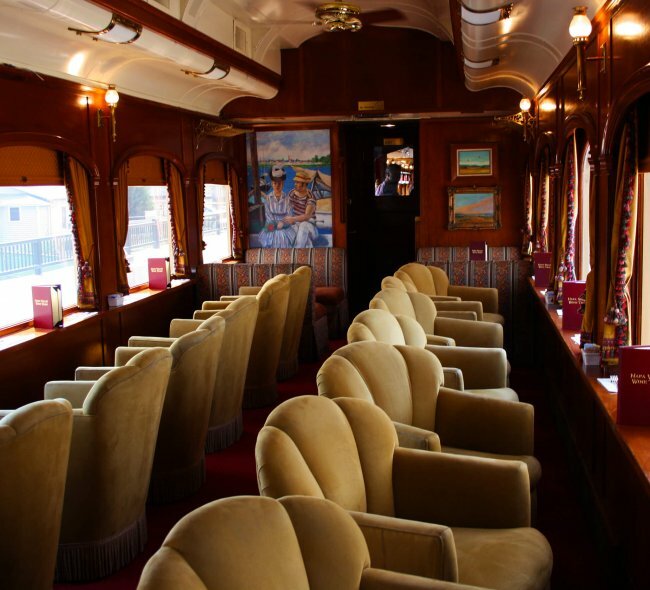 After acquiring them in 1987, the Napa Valley Wine Train undertook an extensive restoration project to restore and reimagine the cars—Honduran mahogany paneling, brass accents, etched glass partitions, and velveteen fabric armchairs. 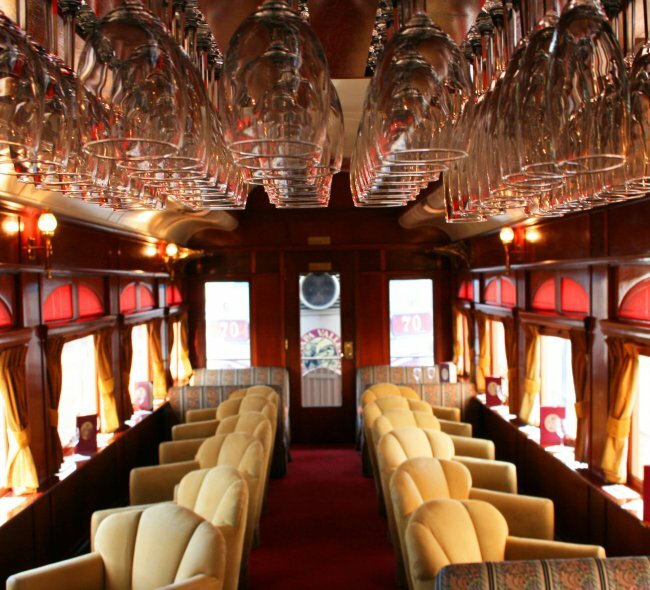 Luxurious interiors evoking the spirit of opulent rail travel at the beginning of the twentieth century. Originally built for the Northern Pacific Railway in 1915, this Pullman comes from the Denver Rio Grande. The car still bears its first owner's logo, the Northern Pacific Yin-Yang, and features original red glass windows that were uncovered when it was restored and an observation deck for guests to enjoy the beautiful Napa Valley weather. It was one of four cars on the Wine Train's inaugural trip on September 16, 1989. One of the 1915 Pullmans that came from the Denver Rio Grande, originally built for the Northern Pacific Railway. It was added to the consist in 1991, the Napa Valley Wine Train’s third year of operation. Originally an abandoned boxcar, the Power Car ensures constant power supply for the Train, operating lights, air conditioning, fans, and the kitchen. Aptly named after the strongest alcoholic beverage made from grapes, it is believed to be the only power car in existence that passengers can enter and walk through while in operation. 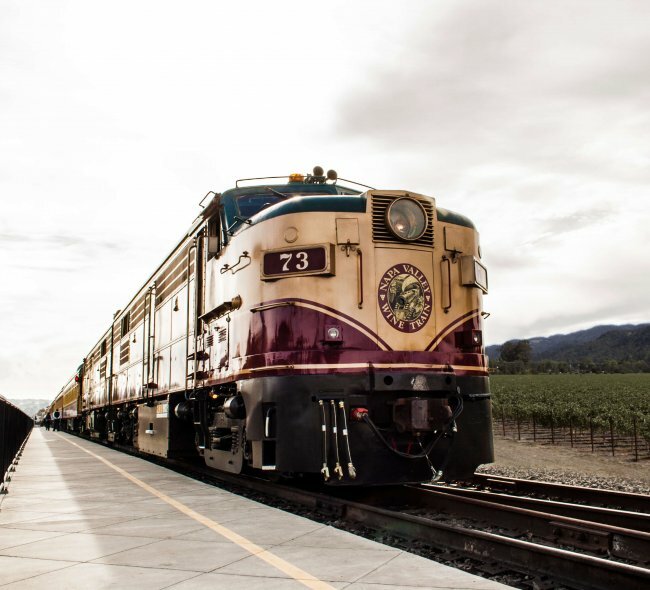 It is the newest addition to the Napa Valley Wine Train’s consist, joining the daily runs in June 2013 after undergoing an 8-month renovation. 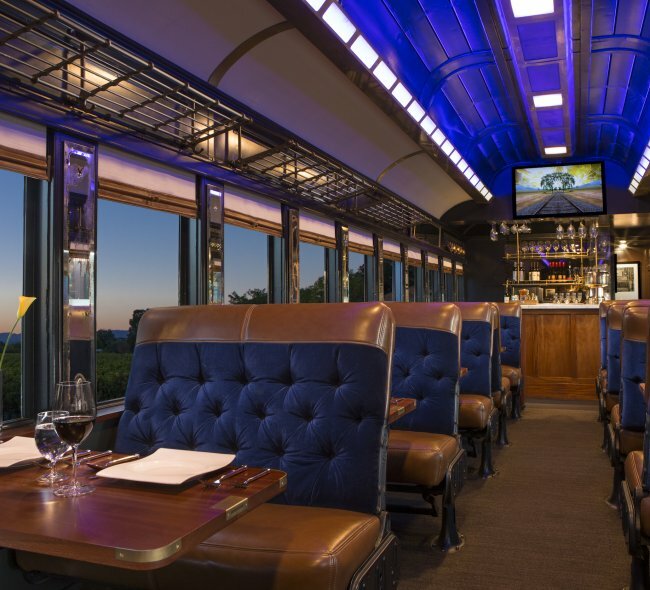 Built in 1952 as one of the first ten full dome cars constructed by Pullman Standard, the Vista Dome is a two-story rail car offering exclusive luxury dining upstairs and a state of the art kitchen downstairs. First in service on the Olympia Hiawatha, it was dubbed "The Columbia" when it sold to Canadian National, then to Via on the Super Continental. Tour Alaska renamed it "Mt. McKinley" before it went to California for the Sun Express and later to Amtrak. Its exterior was refurbished at the Ringling Brothers, Barnum and Bailey Circus train yard and it joined the line in 1997. Originally built for the Northern Pacific Railway in 1915, this Pullman comes from the Denver Rio Grande. 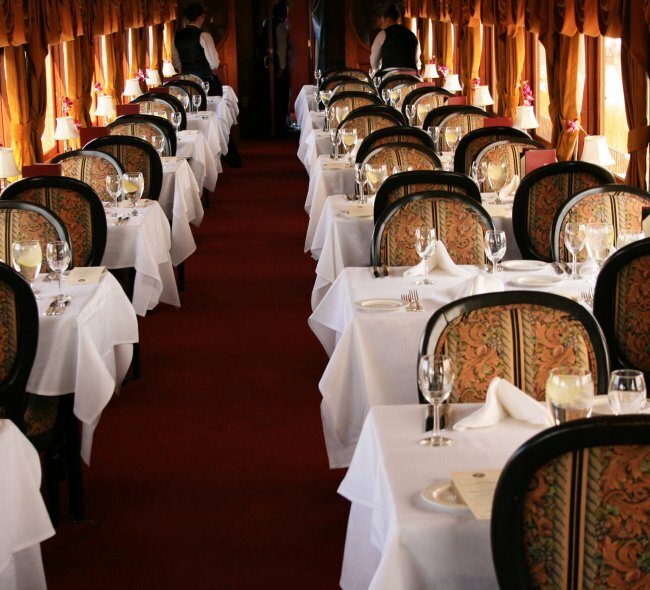 Today, it boasts the largest capacity (72) and is one of the two main dining cars for our Gourmet Express Dining Journey, with tables for four along both sides of the car. It was added to the consist in 1990, the Napa Valley Wine Train's second year of operation. 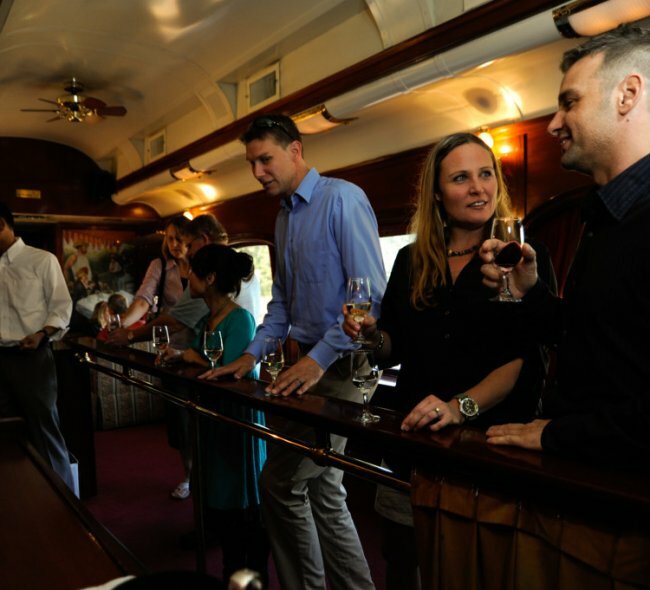 The Wine Train's main kitchen car is a 1915 Pullman originally built for the Southern Pacific Railroad. It was acquired from the South Carolina Railroad Museum and converted to Kitchen Car. 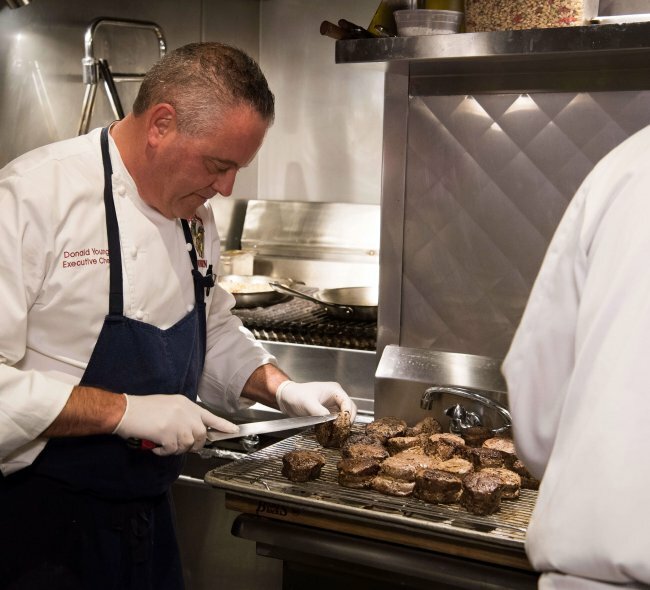 A mahogany passageway with windows allows guests to come and view the chefs in action, preparing all of the meals made fresh to order on board. 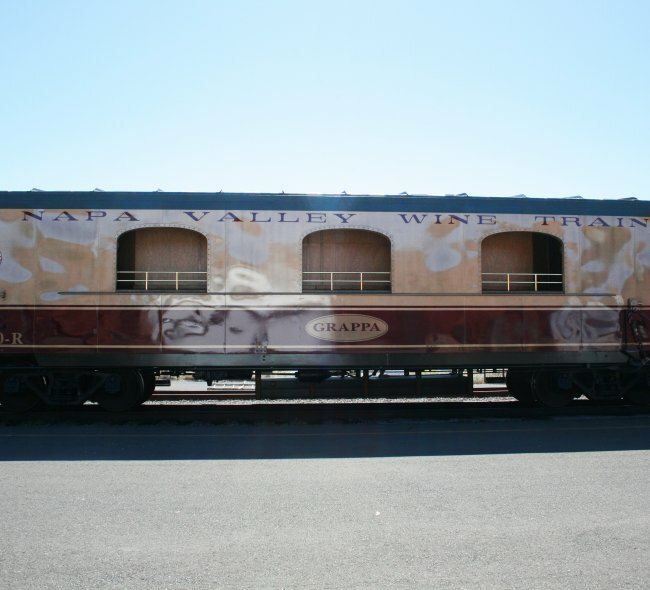 This was one of the four cars on the first Wine Train that ran through the Napa Valley on September 16, 1989. 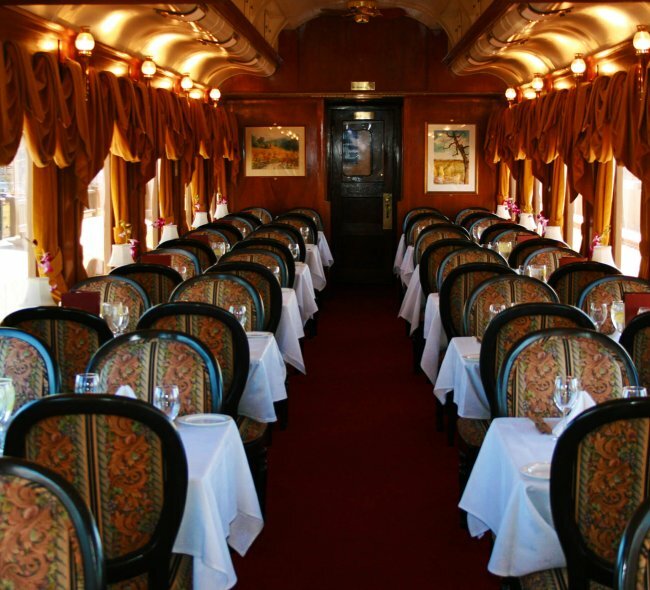 The Gourmet Express Dining Car was originally built in 1917 as a reclined seating coach. Today, it is one of our two main dining cars for our Gourmet Express Dining Journey, with tables for two on one side and tables for four along the other. 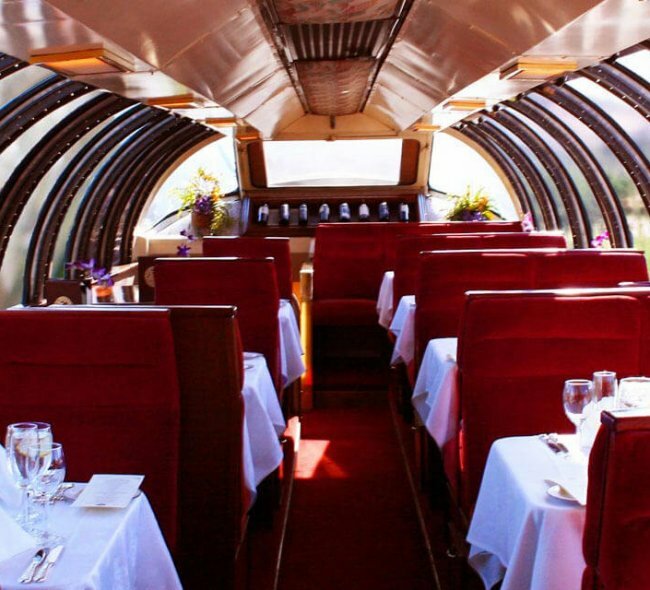 It was purchased by the Napa Valley Wine Train in the late 1980s from a private citizen. 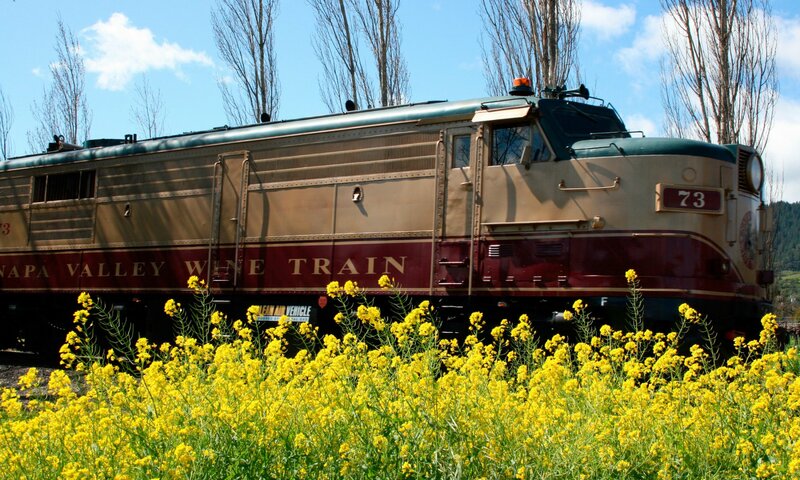 This was one of the four cars on the first Wine Train that ran through the Napa Valley on September 16, 1989. 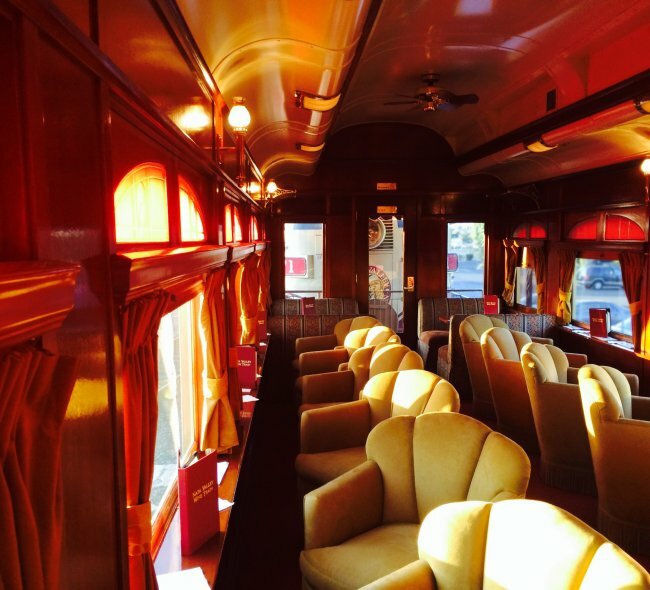 This 1915 Pullman rail car was the augural Quattro Vino Tour restored vintage rail car added to tour schedule in 2016. This rail car transports our guests on the Estate Tour as well as for special events. The car features mahogany table tops, leather and velvet upholstered seating, finely appointed restored vintage hardware and mirrors. This private car has a on-board kitchen and full bar. The Merlot Lounge Car is one of the 1915 Pullmans that came from the Denver Rio Grande, originally built for the Northern Pacific Railway. Today, this car is a comfortable lounge offering dessert and coffee service. It was added to the consist in 1990, the Napa Valley Wine Train's second year of operation.